Main Phase: Exhaust this card to banish an Event from your discard pile. 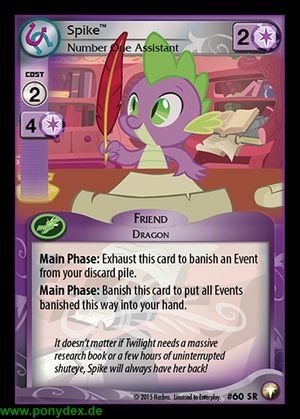 Main Phase: Banish this card to put all Events banished this way into your hand. It doesn't matter if Twilight needs a massive research book or a few hours of uninterrupted shuteye, Spike will always have her back!